I debated whether this should go in "Researcher's Study" or "Unicorn Terrace." I put it here because I am mostly reporting an art historian's study of the topic. It builds on a theme in the "Petrarch Trionfi Motifs in early Trionfi decks" thread, notably my post at viewtopic.php?f=11&t=906&p=13355&hilit=Count#p13355, which examined the theme of the virtues in art for the Visconti (which in fact is the topic discussed by the art historian in question immediately before she turns to the present topic), but the present post is somewhat more off that topic than the one I just linked to. Here I also touch on themes in the "How Petrarch Became Famous" thread, as will become evident. In Five Manuscripts of Giangaleazzo Visconti, Edith Kirsch displays a picture of the Cary-Yale (CY) Love card, with a provocative caption. In the text, she doesn't justify her dating and interpretation, but does put the image into a broader context (p. 81). It is a striking fact, which should probably be seen in conjunction with other visual expressions of their dynastic concerns, that beginning with Giangaleazzo the Viscontis demonstrated an unparalleled predilection for pictorially recording their own marriages or betrothals. As suggested in chapter II, the miniature of the patron and his bride on folio 258 in Lat. 757 may be the first wedding portrait in the series (Fig. 51). BR 1 in the Psalter-Hours may be the second (Fig. 65). The group also includes a representation of Filippo Maria and Marie of Savoy on a tarot card (Yale University, Beinecke Library, Cary Collection of Playing cards, No. ITA109 [Fig. 61]) and a portrait of Francesco Sforza and Filippo Maria's daughter, Bianca Maria Visconti, in a miniature in Cremona (Archivio patrocchiale di S. Sigismondo, Atto di donazione, reproduced in Visconti a Milano,, fig. 204). The tradition was carried on by Galeazzo Maria Sforza, whose marriage to Bona of Savoy in 1468 was represented in 1476 by Cristoforo de' Predis in Turin, Bibl. reale, MS. Var. 124, fols.1v, 2v, where the bridal couple, as in Banco Rari 397, are depicted as Anna and Joachim (reproduced in Kirsch, 1981, figs. 70, 71; see also page 51 above). For this last, I see a certain structural similarity to the CY Love card, Cupid replacing the radiant sun. The similarity is even closer for "Marseille" versions, in which there is a sunburst behind Cupid and an additional person below. For the ones of the Madonna of Mercy, I detect a structural similarity to the CY so-called "Fame/Glory" card, with the otherworldly lady above, arms archlike over the this-worldly figures below. Kirsch devotes 7 large pages (78-84) to this genealogy, immediately after her discussion of the 12 Virtues (the 7 plus 5 more) that appear in it (see , and before another genealogy illustrated for Filippo. I will try to cover the parts relevant for us. 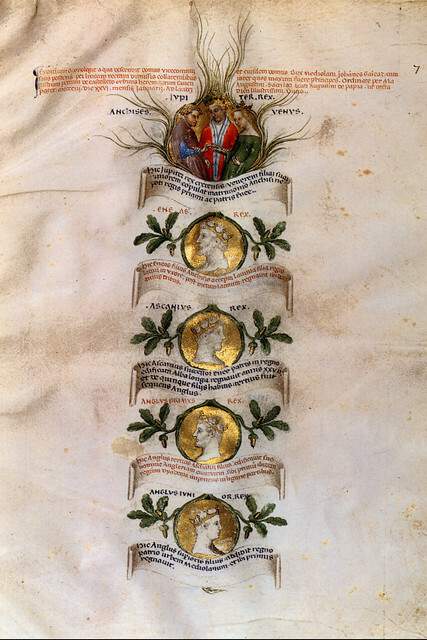 To read more about these illuminations, see http://trionfi.com/visconti-genealogy, where there is an enumeration of the complete genealogy, thanks to Ross, and a reproduction of the last page. What is of interest here is primarily its first page. Here is the end of Kirsch's introductory section on this topic, which you will notice also suggests a connection to Petrarch, about which more later. The flamelike roots of the Visconti family tree at the top of folio 7 in the Paris manuscript (Fig. 31) form a roundel within which Jupiter joins his daughter Venus in marriage with Anchises, underscoring the Visconti claim to descent, through Venus, from the king of the gods himself. [Footnote: In the marriage scene, Jupiter assists Anchises in placing an enormous ring on the index finger of Venus's right hand. Rings are also prominent in the only two surviving panels by Michelino, both of which represent marriages--the Marriage of the Virgin in the Metropolitan Museum of Art and the Mystic Marriage of Saint Catherine in the Pinacoteca, Siena. The particular attention paid to rings in these paintings has led Eisler [The Prayer Book of Michelino da Besozzo, 1981], 12, to suggest that Michelino may have been trained as a goldsmith. [There follows the paragraph I quoted at the beginning of this post.]] The family's descent from Jupiter is emphasized also by the oak leaves with golden acorns that frame the roundels throughout the genealogy. [Footnote: Michelino's awareness of the oak not only as the tree of Jupiter but also as the tree of the Golden Age is suggested by the golden acorns in the genealogy. See also chapter II, note 24. As we have seen above, the oak also plays an emblematic role in Giangaleazzo's Psalter-Hours in Florence (Fig. 29) and in the miniature of Giangaleazzo's investiture as Duke on Folio 1 of the Coronation Missal (Fig. 3)....[other examples follow]]. The prominence of Jupiter and Venus here has led Trionfi, in the link given above, to speculate a connection with the "game of the gods" designed by Marziano (at some time between 1415 and 1425), in which 2 of the 4 chief gods of the suits were Jupiter and Venus: the deck in this way expresses specifically Visconti mythology. The format was as follows: between fictive pairs of columns, full-length representations of one or more Roman heroes were painted. Beneath the narrative scene was a titulus inscribed on a painted scroll (fig. 101). The similarities with the Visconti genealogy are apparent. For better photos, see http://www.arpai.org/padova-universita- ... -20062007/. Kirsch is relying on Mommsen that the layout of the 1540 repainting was similar to the original. Another similarity with Petrarch is the context within which this connection to the Greco-Roman gods is set, namely, a Christian prayer-book. It is this joining of pagan and Christian that Petrarch accomplished, after much revision, in his "Triumph of Fame" and continued in De Viris Illustribus (Baron, From Petrarch to Leonardo Bruni, p. 44). The figure below Anchises in the left border is evidently a female, because her hair is entwined with a ribbon and she wears a hat, which in the genealogy on LF 57v is apparently reserved for females. This woman may be Hippodameia, the daughter of Anchises and Venus, "whom her father and queenly mother heartily loved in their hall, for that she excelled all maidens of her years in comeliness, and in handiwork, and in wisdom." [Footnote: Iliad xiii, 429ff. (trans. A. T. Murray, II, London, 1924. On the right side, the top figure, looking at Venus, is Aeneas's wife Lavinia. Beneath her is either their son Ascanius, or their grandson Anglus Senior, crowned in laurel. The beardless youth beneath him is Anglus Junior. So they are the same people as on page one of Giangaleazzo's genealogy. The Angluses are not part of Roman mythology; they are Visconti mythology, made up to link them with the gods, something that later became quite fashionable; Anglus Junior is the mythical founder of the Viscontis' ancestral town. The figures in the lower corners may also allude to Filippo Maria's parents, Giangaleazzo and Caterina, who were first cousins (and hence, like Hippodameia and Anglus, collateral members of the same family), who needed a papal dispensation for their marriage. The male and female cousins in the lower corners of trees of consanguinity (Fig. 99) are also suggested by this image. Like Filippo Maria, the young woman and man at either side of him are also shown in three-quarter view, in contrast to the strict profile views of the other figures in the genealogy. The representation of Filippo Maria is the largest on the page. Set within blue and pink clouds against a golden radiance, it is clearly intended as a parallel to the portrait of his father on BR 115 (Fig. 47). Whereas in the earlier representation, however, Giangaleazzo is bareheaded, Filippo Maria on LF 57v wears a wreath of roses, like the figure we have identified as Anchises. If the rose-wreath is to be understood as an emblem of a bridegroom, Filippo Maria's portrait on this leaf would provide a date for the beginning of the completion of his father's prayerbook--1427, when he married Marie of Savoy, who was in turn descended from the family of Filippo Maria's grandmother, Blanche of Savoy. In that case, Filippo Maria might have been following yet another precedent set by his father: the commissioning of an illuminated prayerbook to commemorate his marriage. But if so, there is a hole in this commemoration: we have a bridegroom but no bride. Genealogies, to be sure, can leave out the wives: what is important is the patrimonial line. Yet his father had in fact done an illumination with both spouses, and so did his descendants. Filippo saw himself in his father's footsteps, and he was a superstitious man; artworks could function a kind of a talisman for its owner. A miniature with both spouses was needed. Yet Filippo was also distrustful of his wives. He had just had one beheaded for alleged adultery. (And this particular page of the manuscript deals with the "transfer of blame": Adam's pointing to Eve as the cause of his sin--after which Filippo practices the second of Petrarch's Triumphs!) What better talisman than a playing card, which can be done over as desired, without having to replace a page in a book--if not the one she identifies as Filippo and Marie, with Visconti and Savoy banners flying, then one of similar design (but perhaps minus the fountain on the man's chest), in that period of the prayer-book's completion, 1427-1434? If you look at the man's face, who does he resemble more, Filippo or Francesco? (It is not clear, but I think it is closer to Filippo's picture than Francesco's, although it hard to know who is trying to emulate what, never mind the actual reality. 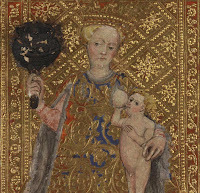 In the commemorative miniature, http://www.storiadimilano.it/arte/impre ... age049.jpg, from http://www.storiadimilano.it/arte/imprese/Imprese07.htm) the face is not much similar to the card's. There is also the issue of the hose, red and white (and blue?) in the Sforza, perhaps for Cremona and Pavia (Lorredan at viewtopic.php?f=11&t=855&p=12322&hilit= ... ose#p12322), or maybe for mulberry trees (per SteveM in the same thread). The hose looks red and white on the CY Love card, but the red may have fallen off of one leg. It doesn't mean much, in context, presuming that the Sforza miniature was done after he took control of Pavia. Heraldics, of course, are a noteworthy feature of the CY as a whole, missing from the Brera-Brambilla court cards which are otherwise similar. If indeed the fountain is a Sforza heraldic (per Kaplan, but that's not enough; and the quince, in Swords, unless it's just a fashionable dress design), particular heraldics could have been added any time after the betrothal of 1431, although at a time when Sforza was in Filippo's service. In that way Filippo's own marriage, and that of his ancestors, could be commemorated while also commemorating the anticipated marriage of his only child. I think the thing forgotton is the name Bianca. Calling her that almost legitimizes her as a Visconti, regardless of her parentage and her illegitimacy. I fully accept that this CY deck may well have been a betrothal deck and not a marriage deck. Now when Azzone Visconti died heirless his wife was Caterina of Savoy- she lived a further 49 years. Lucciano and Giovanni became joint heirs and it was during Giovanni's rule that Petrarch enters. When Giovanni died incomes his three Nephews whose father was Stephano and mothers was Bianca. Now there is three green bottles hanging on the wall of Milan. One bottle gets killed off in a year. Caterina of Savoy is still alive and her Nephew Galeazzo 11 marries Bianca of Savoy and keeps the connection to Azzone alive. It is this marriage that I think the CY Lovers card alludes to. Therefore totally entitled to wear red and white of Savoy calze by marriage not blood. Now his mother and his bride have the same name. So who do I think is the groom on the card? 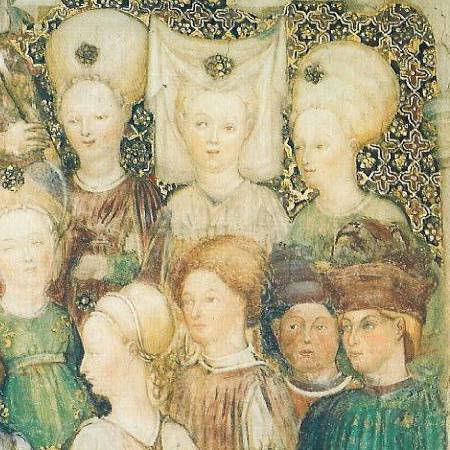 Galeazzo Visconti 11 (1320-1378) and Bianca of Savoy is the bride Bianca's great Grandmother- the Savoy thus legitimizing the illigitimate. Her father is giving her lineage and upping her value. I think I see your point about the card commemorating Blanche/Bianca of Savoy. The Filippo/Marie of Savoy marriage doesn't do anything to enhance the value of Bianca Maria, but the earlier marriage of her namesake does. I imagine several early copies of the CY being made: the first, perhaps minus some heraldics, for Marie of Savoy, commemorating that marriage; one to Francesco, as a betrothal present; and one to Bianca Maria and her mother, also as a betrothal present. 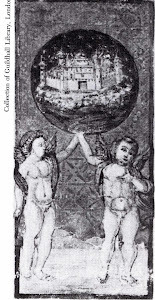 In that last case, Marcos's interpretation of the CY Fama card, as depicting Filippo on his way to the red-castle love next he had set up for Bianca Maria's mother (viewtopic.php?f=11&t=910#p13268), acquires significance (not to negate other interpretations). Whether the extant copy we see is any of these three is another issue. Although doubtful, it may even have been made (copying a deck now lost) in 1468, to show how Galeazzo Maria was a faithful Visconti, too. The Bembo workshop was famous for being able to paint in obsolete styles, according to Evelyn Welch in the 1996 Dictionary of Art. I don't think anyone disagrees with the close resemblance between the Lancelot of the Lake illustrations of c. 1445 (attributed to B.Bembo) and the CY deck, so could either one of you explain how the CY deck could celebrate events decades before or after c. 1445? I agree that the Lancelot drawings are by the same artist as the CY and the PMB, and that the artist is of the Bembo workshop. Evelyn Welch in 1996 (Dictionary of Art, entry on "Bonifacio Bembo") challenged the definite attribution to Bonifacio of these works and most of the surviving others attributed to him; while they are all by the same artist, it is not clear which of the Bembo did them. Well, if I understand you correctly, here's my short answer: It's not hard for a 1445 deck to celebrate an event that happened decades earlier: it's called a commemoration, i.e. a celebration of something that happened a while back: years, decades, centuries. It's also not hard for a 1445 deck to celebrate something that will happen decades hence, as well as commemorating an event that occurred 1445 or earlier: you simply wait until the event you want to celebrate, and make a copy of the c. 1445 work. I will explain the techniques they had for copying later in this post. Now the longer version. At the end I reproduce Welch’s essays, for reference. The artist was probably popular with the Sforzas for his ability to imitate and repaint earlier works commissioned by the Viscontis. He usually worked with associates and a strong individual style was not encouraged. Bembo, Bugatto, and Poppa were criticized by Galeazzo Maria Sforza for not fully integrating their separate manners in the frescoes in S. Giacomo fuori Pavia. The last part gives us a clue as to why it is hard to say whether something is one artist or another. I will get to techniques for duplicating cards later. The CY could also have been done before the 1440s, as early as 1427 or so. The painting of frescoes (mostly lost), for which Bonifacio is chiefly credited, involves different skills from the painting of miniatures. Miniaturists and fresco painters even belonged to different guilds, although I don't know that that would have prevented an artist from doing both. I don't know why Kirsch dates the CY Love card to the "second quarter of the 15th century." But if such an artist did the CY, the Brera-Brambilla, and the Lancelot, and Bonifacio or some other was skilled in continuing the same graceful style for the Sforza, the earlier artist could have been active from the 1420s to at least c. 1445, and probably supervising others after that. We don't know who he would be. 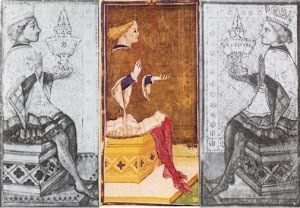 In 1986 (The Visconti-Sforza Tarot Cards, p. 12) Dummett could seriously entertain (without agreeing or disagreeing) the possibility, advanced by Algeri in 1981, that Zavatarri did the CY, the BB, and the Lancelot; his dates of known activity go from 1417 to 1453 (p. 13). With Welch, I am merely shifting the hypothesis to an unknown artist--or artists--of the Bembo workshop. For example, there is Bonifacio's father, active from 1425 to 1449. 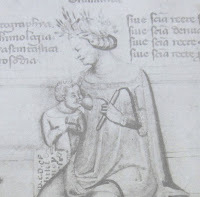 And for the period after c. 1440-1450, there is also Ambroxio Bembo, about whom little is known except a 1450 drawing in an account book that begins with his name, very much in the style of the CY and the Lancelot (see Welch article; I thought I posted this Ambroxio drawing somewhere, but I can't find it now or remember where I found it). Dummett admits that "there is little attributed with certainty to Bembo, save the frescos in the Cavalcabo chapel in the church of S. Agostino in Cremona" (p. 12). If Welch's survey of scholarly opinion is accurate, Dummett is wrong about the frescoes in the Cavalcabo chapel; what is certainly by Bonifacio, Welch says, are the fresco portraits in the chapel of SS Daria and Grisante of that church. The Cavelcabo frescoes have "little in common" with the two portraits, Welch says. But when Dummett says there is "little attributed with certainty" to Bonifacio, he is right. It used to be thought that Bonifacio could not have painted the CY because Filippo would not have entrusted such an important task to an artist just starting out (Dummett raises this objection in 1986). Welch even gives “fl. 1447-1478” for his dates. However in looking at other Visconti commissions, I see that they clearly did give the work of painting miniatures to artists just starting out: Michelino in 1403, Belbello in the 1420s. Probably it was cheaper that way. On the other hand, there is no indication, other than the cards, that anybody in the Bembo family ever worked for Filippo Visconti. In an undated letter, Bonifacio recollects that he supported Sforza in Reggio Emilia and Brescia in 1447 (Welch on Bonifacio, first sentence). Whether that implies that he had worked for the Visconti but wished to display his loyalty to Sforza I leave to others. Perhaps Bonifacio did do the CY and the other work attributed to him. In that case, the CY would probably have been painted (or painted first) in the 1440s, because Bonifacio would have been too young earlier. Yet it could still be a copy, with adjustments and variations, of an earlier deck now lost, and so commemorate marriages or betrothals of an earlier time as well as celebrating either a marriage or a christening in the present. Since they weren't anticipated to be collectors' items, these earlier decks would not have been saved by later generations. Perhaps they weren't as fancy. Or they were destroyed because of bad memories (as Marie of Savoy might have had). A bear in the Bergamo model-book, for example, reappears almost line for line in Giovannino de' Grassi's Book of Hours for Giangaleazzo Visconti. In the 15th century, parchment was used rather than wood or wax. In that century, too, model-books gradually got replaced by sketch-books. An artist would make preliminary sketches for himself, either from life or from other work, in preparation for later work. Ames-Lewis gives Pisanello as an early example of the sketch-book artist. A later example might be Duerer, in a work we discussed over on the Unicorn Terrace. He actually traced part of an engraving by the Sola-Busca Master (per art historians) into his sketch-book and enlarged upon it with the idea of making an engraving of his own. Art at that time was changing from being a collective and anonymous effort to being the expression of an individual artist known in his own right, albeit without copyright protection. The signature at the bottom of a work was changing from being that of the head of the workshop, certifying its origin from that workshop, to that of a single artist claiming that his personal artistry is responsible for the entire process (not, however, that he himself did the entire process: artists had assistants, and making woodcuts was a trade that Duerer hired out). At this time in Lombardy—and even in the time of Galeazzo Maria, we have seen--individual differences were not prized: there is little to distinguish the frescoes of the Zavatarri from other work of the time (and from the Bembo under Sforza, who were considered good at imitating outmoded styles, Welch says). That is not to say there weren’t differences. I notice that the same graceful style of the portrait of Filippo in the Visconti Hours appears in the cards and the Lancelot--as opposed to, say, the miniature of Francesco Sforza and Bianca Maria that I posted earlier, or the one work that is agreed by all to be the work of Bonifacio Bembo, their portraits from the Chapel of Daria and Grisante in Cremona. But these differences might also just be different styles of one artist—or workshop! Art historians have given much attention to the three hand-painted Tarot packs generally attributed to Bonifacio Bembo. None, to my knowledge, has paid any attention to the many other fragments of such packs that can be associated with Milan or with Lombardy generally. Among these sets, several (about a dozen) contain, or wholly consist of, cards copied from the Colleoni pack, sometimes reversed, sometimes with the original orientation; one of these, consisting of four cards, is in the Victoria and Albert Museum. (38) In most cases, the inclusion of one or more cards copied from the Colleoni pack provides the only ground for associating the pack from which the set is derived with Lombardy. In every set which includes a card illustrating one of the trump subjects for which the six supplementary cards were supplied, that card is invariably a copy of the corresponding supplementary card, showing that the card was copied from the Colleoni pack as we have it (save for not lacking the four cards that are now missing). It is always the Colleoni pack that is copied, never the Brambilla or Visconti di Modrone pack. This fact demands some explanation, but I know of no art historian who has adverted to it, let alone explained it. These cards really deserve to be looked at by anyone interested in how hand-painted decks were made. Here is the World card, in the PMB, Bomoni (Kaplan vol 2 p. 23), and Guildhall (Kaplan vol. 1 p. 104) versions. I don’t know how the "reversed" copies were made. Was it by means of an optical device, such as a camera obscura? After the 1450s, I would expect that device to have made its way to Lombardy from either Florence or Flanders: the contemporary British artist David Hockney has pointed out signs of its use in paintings in those two places from c. 1430. According to Wikipedia (http://en.wikipedia.org/wiki/Hockney%E2 ... lco_thesis), the camera obscura was described in the 13th century by Roger Bacon and again by Leonardo da Vinci in his notebooks 1478-1512. A reversed image is projected against an opaque surface, which can be reversed again through the use of a mirror. Then the image can be traced if paper is put on the surface illuminated. Or perhaps there was no optical device, but just someone good at reversed images, like there are people good at writing backwards. Such talents would have been useful in making woodblocks. However the reversed copies were made, they are quite close to the original. From a letter of 1451 from Bianca Maria Visconti to her husband Francesco Sforza, asking him to send to Sigismondo Malatesta, lord of Rimini, a pack of Tarot cards of the kind made in Cremona, which he had asked for the previous autumn, we may infer that Cremona was especially renowned for hand-painted playing cards of this kind. [Footnote 39: Gregory 1940 [Winifred Terni de Gregory, Bianca Maria Visconti, duchessa di Milano], p. 157, quotes this letter, asking the Duke to send to Sigismondo Malatesta a pack of "carte da trionfi de quelle fatte a Cremona", together with a straw hat, another speciality for which Cremona was famous. She quotes it again in Gregory 1958 [Pittura artigiana lombarda del Rinascimento], p. 32, where the phrase is given slightly differently as "quelle carte da trionfi che se ne fanno a Cremona".] Sandrina Bandera, in the catalogue to the Brera exhibition of the three packs by Bonifacio Bembo, emphasizes the production by the Bembo workshop of paintings and of decorated objects of all kinds; she also stresses the use by such workshops of "sketch-books" containing standardised motifs which could be used in different works. [Footnote 40: Bandera 1999, pp. 16, 26.] Almost all of the fragmentary sets are probably authentic, and if the packs from which they derive were painted in Cremona, it thus seems likely that in the later XV or early XVI century the Colleoni pack was held in Cremona, and was available for artists to copy from. It must have been given to the city by some member of the ducal family who had a particular connection with Cremona. It seems to me that there would have been a similar process available in the case of the CY, although more freely done. One deck could beget others. And the styles could be extremely similar; any differences in style from one artist to another, in the same workshop, could perhaps, in this period of greater collectivization, be undetectable. Also, heraldics could be added and subtracted as required by the commissioner. An example of this looser style of copying might be in the CY Charity card: the suckling child resembles Bartolomeo’s 14th century Grammatica. 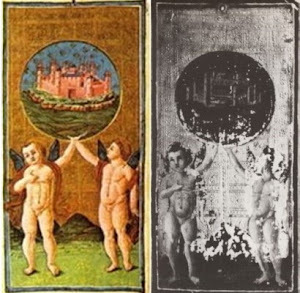 A similar but looser copying generates the PMB additions to the CY from Giotto’s Virtues and Vices series in Padua, so as to add negative cards to the CY’s positive ones. So there are various ways in which the CY or an earlier version of it could have been done in the 1420s or 1430s, or as a later version in the 1460s, based on known techniques of the time. For us, it is a matter of tolerating the existence of the unknown--artists as well as decks and other artworks--in relation to theories we are disposed to disagree with as well as to those we do not (my variation on a Bertrand Russell quote, http://thinkexist.com/quotation/what_a_ ... 38995.html). And let me be clear: I am not giving a theory as to the origin of the tarot: I am only to 1427-1431, and that is only halfway to 1410. Addendum: Welch's Bembo entries in the Grove Dictionary of Art (1996, but with 1992, 1998, and 1999 bibliographic entries added to the electronic edition) do not seem to be widely read by the tarot history community. So I give two of them below (omitting the one on Benedetto), for research purposes only. In the article on Bonifacio, the word "Sforza" in the second line of the paragraph beginning "Mulazzani" should undoubtedly be "Visconti". There are a couple of notable omissions in her survey of the literature. She does not mention Algeri; nor does she mention an insightful essay about the so-called "Longhi Triptych"by Edith Kirsch in 1995: "Bonifacio Bembo's Saint Agostino Altarpiece", in Studi di Storia dell' Arte in onore di Mina Gregori, pp. 47-50. Kirsch argues in much more detail for the interpretation Welch adopts (without, however, discussing the attribution question). Italian family of painters. At least nine artists with the name Bembo were active in Cremona between 1425 and the end of the 16th century. The two best known, (1) Bonifacio Bembo and (2) Benedetto Bembo, were the sons of Giovanni Bembo (fl 1425–49), a master who worked both in his home town and in Brescia. Another son, Andrea Bembo, also a painter, became a Brescian citizen in 1431, and a further member of the family, Ambrosio Bembo, is recorded in Cremona in 1450. (3) Giovan Francesco Bembo is thought to be the nephew of Bonifacio. M. Caffi: ‘Di alcuni maestri di arte nel secolo XV in Milano poco noti o male indicati’, Archv Stor. Lombardo, v (1878), pp. 82–106. C. Bonetti: ‘I Bembo, pittori cremonesi’, Boll. Stor. Cremon., i (1931), pp. 7–36. (fl 1447–78; d before 1482). In an undated letter Bonifacio recalled his support for Francesco Sforza’s cause in Reggio Emilia and Brescia during the conflict between Milan and Venice in 1447. By 1455 he was in the service of the Sforza family, although the exact nature of his work is not recorded. The following year he was called to Pavia to carry out a number of commissions, including touching up and repainting a hunting fresco dating from the time of the Viscontis, the previous rulers of Lombardy, in the castle’s great hall. Work was slow and in 1458 the artist was ordered to take on assistants to complete the job more quickly. Francesco Sforza was eager to emulate his predecessors and their artistic monuments. In the letter referred to above, Bembo mentioned that he had added two figures to a series of baroni in the Palazzo Visconti–Sforza in Milan. The frescoes have disappeared, but later writers recorded the signature and date De Bembis de Cremona 1461. Francesco and Bianca Maria Sforza also commissioned Bembo to produce original work. He provided an altarpiece, erected in commemoration of their wedding day, 25 October, the feast day of SS Daria and Grisante, for their chapel in S Agostino, Cremona. Bembo was paid in 1462 from tithes gathered in honour of the two saints, but in 1469 he was still owed money for the altarpiece. In 1467 he was paid for the high altarpiece of Cremona Cathedral along with the woodworker Pantaleone de Marchiis. This has recently been identified with the Virgin and Child with Angels (Cremona, Mus.Civ. Ala Ponzone). After the succession of Galeazzo Maria Sforza in March 1466, Bembo’s work for the court increased. He was recalled to Pavia in 1468 and worked for three years on secular decorations, including scenes of the Duke and Duchess hunting, dining and performing official duties; he also undertook further retouching of the Visconti frescoes. He may have been involved in similar projects to fresco the Castello Sforzesco, Milan, between 1471 and 1474, but in August 1471 Bembo, who had returned to Cremona to answer persistent law suits, was told that he was no longer required in Pavia or anywhere else. A year later, however, Bembo was again working for Galeazzo Maria alongside Leonardo Ponzoni of Cremona and Zanetto Bugatto on a chapel outside Vigevano, and in 1473 he directed the work in the newly built ducal chapel in the Castello Sforzesco. The frescoes of standing saints and the Annunciation along the walls as well as the Resurrection in the vault survive, although they have suffered from extensive restoration and repainting. Bembo’s precise role here is difficult to assess; while he showed the Duke drawings for the chapel, several other artists, including Stefano de’ Fedeli (fl 1472–81), who completed a sixth of the frescoes, worked either for or alongside him. It was common practice in Lombardy to set up temporary teams of artists for such large-scale projects, and Bembo often worked with associates. In 1474 he collaborated with Giacomino Vincemala on a chapel in the church of S Maria da Caravaggio and with Vincenzo Foppa and Zanetto Bugatto on the polyptych designed to hold over 200 relics in Pavia. In 1476 he produced, with Foppa and Bugatto, a large cycle of 21 episodes from the Life of Christ for the church of S Giacomo fuori Pavia. After Galeazzo Maria Sforza’s assassination in 1477, Bembo’s work for the court practically ceased. He was still trying to obtain payment for the chapels in Caravaggio and Vigevano many months after his patron’s death. In 1482 his son Lodovico Bembo, also a painter, was recorded as ‘filius quondam magistri Bonifacii’. Despite considerable documentation, Bembo’s oeuvre is difficult to assess. His only secure works are two badly damaged fresco portraits of Francesco Sforza and Bianca Maria Sforza, originally on pillars facing the altar in the chapel of SS Daria and Grisante in S Agostino, Cremona. Subsequently transferred to canvas and in ruinous condition, the works now hang inside the chapel. While the two kneeling figures have dry, severe profiles with little sense of weight or depth, the relatively well-preserved head of Francesco Sforza reveals the hand of a competent portrait painter. Details such as the mole on the Duke’s cheek, the folds of his chin and the thin, pursed lips are carefully moulded with shadowy lines. The earliest work attributed to the artist, the Cavalcabò Chapel in S Agostino, Cremona, has little in common with these portraits. Giovanna Cavalcabò paid for its decoration in 1447, stipulating that the work was to be completed within five years. Although there is no direct connection between Bonifacio and the chapel, his name has been associated with it since Wittgens’s publication (1936). The Cavalcabò artist had a fine decorative style showing the influence of Michelino da Besozzo and the Zavattari brothers. The vault and apse of the chapel contain elaborate frescoes of the Evangelists, the coronation of Christ and the Virgin, and various saints, angels and figures representing theological virtues. Bright colours predominate and the doll-like figures are drawn with thin, curving lines. The hand at work here was prolific and influential. The same highly refined graphic style can be seen in numerous small-scale works such as the illuminated History of Lancelot (1449; Florence, Bib. N. Cent., cod. Palatina 556) and a series of ceiling panels of scenes from the Old Testament (Cremona, Mus. Civ. Ala Ponzone). The chapel of Bishop Carlo Pallavicino in Monticelli d’Ongina (Lodi) shows a similar method of working in fresco. Other related works include several sets of tarot cards (Milan, Brera; New Haven, CT, Yale U., Beinecke Lib; Bergamo, Gal. Accad. Carrara; New York, Pierpont Morgan Lib.). Mulazzani (1981) attempted to reassess the works attributed to Bembo. Correctly noting that the Brera tarot cards were produced for Filippo Maria Sforza in the first half of the century, he suggested that they, and all other works related to the Cavalcabò Chapel, be given to the Master of the Visconti Tarocchi. The problem has been further complicated by the discovery of a small sketch, in this master’s hand, on the cover of a Cremonese account book. One of the first payments recorded (9 April 1450) is to ‘Magistro Ambroxo de Bembi’. Thus this body of highly stylized work may indeed be associated with this previously unknown member of the Bembo family. Characterizing Bonifacio’s work becomes, therefore, increasingly problematic. Mulazzani assigned the triptych (Cremona, Mus. Civ. Ala Ponzone; Denver, CO, A. Mus.) reconstructed by Longhi (1928) to Bonifacio and centred the rest of the oeuvre on this. According to Mulazzani, Bonifacio was also responsible for the Castello Sforzesco Chapel and for the frescoes (1476) of the Procession of the Magi and the Annunciation in the Collegio Castiglione Chapel, Pavia. But the Longhi Triptych, with scenes of the Meeting of Joachim and Anna, the Adoration of the Magi and the Coronation of Christ and the Virgin, is one of the most problematic pictures attributed to Bonifacio in both style and iconography. Mulazzani’s assessment is based on Bandera’s mistaken belief (1977) that the painting is the altarpiece produced for the chapel of SS Daria and Grisante in S Agostino and can, therefore, be dated to the early 1460s. However, the central scene is not the crowning of SS Daria and Grisante, but a peculiar Cremonese rendition of the dual coronation of the Virgin and Christ. This unusual iconography also appears in the Cavalcabò frescoes, as well as in the remains of a small portable triptych, attributed to Bembo (Avignon, Mus. Petit Pal.). While the Longhi Triptych differs from the small-scale works, many common elements remain. The painting contains much of the Gothic elegance seen in other 15th-century Cremonese works although tempered with a greater sense of spatial depth and highly individualized portraiture. The problem of identifying Bonifacio’s work arises from the more general difficulties of the nature of Lombard patronage. The artist was probably popular with the Sforzas for his ability to imitate and repaint earlier works commissioned by the Viscontis. He usually worked with associates and a strong individual style was not encouraged. Bembo, Bugatto and Foppa were criticized by Galeazzo Maria Sforza for not fully integrating their separate manners in the frescoes in S Giacomo fuori Pavia. Cremona produced a flourishing school of 15th-century painters, most of whom are known only through written records. Bembo is the best documented of these artists, and the tendency to group these similar works under his name is understandable. But without further investigation, the traditional attributions to Bonifacio should be considered cautiously. I fully understand archaizing artistic practices and the use of copy model books (I have posted such a page from a model book of the virtues elsewhere; link to the Met's page of it: http://metmuseum.org/Collections/search ... any&pos=10 ), but you have not shown how the CY specifically imitated a supposedly earlier work, unless you are positing what Ross does in that the CY celebrates the later wedding of 1468 to Bona and therefore the Bembo shop - for "some reason" - imitated its earlier work from the 1440s exemplified by the Lancelot of the Lake work (hereafter "LL"). The only comparable to the LL you mentioned was the Cavalcabo Chapel fresco in Cremona dated to 1447; i.e., no other Bembo work aped the fashions of the LL and so seems to have been a style from the 1440s. I don't want to belabor the point of the date of Bembo's works (clearly hard to date as you made abundantly clear) but rather point to the internal evidence within the CY and Brambilla that strongly suggests it was a work of the 1440s and therefore the onus is on the alternate theory to provide compelling evidence for a date outside of that decade. 1. The coins on the pips of the CY and Brambilla are contemporary to the 1440s. Why are those coins relevant to an earlier or later production outside of that decade? F. Sforza, who was desparate to demonstrate a continuity with the Visconti (I see the PMB as a species of that propaganda in c. 1450/1), dispenses with showing specific Visconti coins and rather just the sunburst motif (which makes sense when he would be minting his own coins). Why would Galeazzo need to depict a non-circulating Visconti coin in 1468? Hell, one of the persons who assassinated him was a Visconti – he had rocky relations with the cadet branches of that family. 2. Galeazzo married Bona as a means of creating an alliance between Milan with the King of France and the Duke of Savoy; and then in fact adopted the fleur-de-lys as a personal device (not the stemma of Savoy); see below. Where is the fleur-de-lys in the CY, even on “Bona”??? Almost all depictions of Bona show her with a short veil covered with fleur-de-lys. From the Salome before Herod, Masolino da Panicale 1435, Battistero, Castello Olono. Detail of fresco from Chapel of Queen Teodolinda, Cathedral of Monza (just north of Milan), Zavattari brothers, 1444. 4. The Quince and Fountain motifs in the CY preclude a non-Sforza event; i.e., cannot be earlier than 1441 which is the first time Visconti and Sforza stemma would have been intermixed. 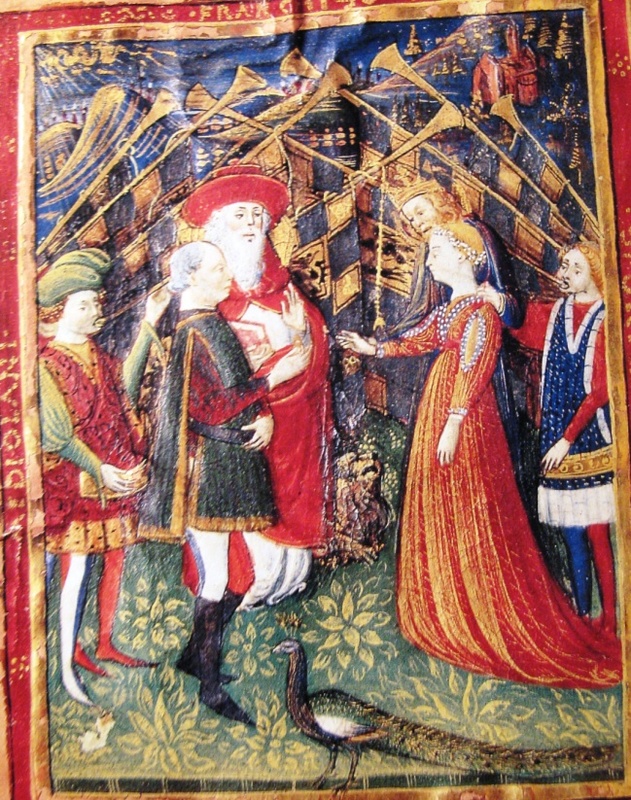 The red/white pennants on the Love tent represent the coat of arms of the ducal seat of Pavia, indicating Sforza as the successor of Filippo (the latter was himself Count of Pavia before coming duke). Phaeded: Yes, I am saying that the scenario that you say Ross proposed, that "for some reason" Galeazzo might have wanted a re-creation of an earlier deck for his wedding, is a possibility. That is what I was thinking of when I said that the CY could have been done as a conscious re-creation of an earlier deck, now lost, to celebrate the 1468 wedding. The main reason for doing so would have been to express the continuity of his reign with that of his Visconti ancestors. Yes, he had trouble with the Visconti nobility. That's why he might have done it: as propaganda. The CY might also be early to mid 1440s, yes. But again, it might have been a near-copy of an earlier deck, with heraldics added, and perhaps coins, if they were copies of real coins (instead of the reverse). The banners could not then have been to represent Francesco Sforza as Count of Pavia. Filippo was Count of Pavia then, and he had not indicated in any way that Francesco was his heir. If the CY was done in 1450, then, yes, the banners could signify Pavia. That, too, is possible, for the same reason as 1468, but more likely, because Francesco desperately needed to portray himself as in the Visconti line then (probably why he issued his own coins with Filippo's "rearing horse" design then, according to "Andy's Playing Cards"). I think the clothing styles are of the early 1430s, give or take a few years, I don't know how many. Pisanello did his frescoes in Mantua and elsewhere (Venice, too, but they are lost) based on sketches he did earlier, c. 1430 (see e.g. http://www.1st-art-gallery.com/Antonio- ... Album.html). He was doing frescoes at Pavia on hunting in 1424 (http://en.wikipedia.org/wiki/Pisanello); the sketches could have been from there, but I suspect that fashions were much the same in Verona and Mantua, where he was later. Actually, Pisanello;s greyhound is very similar to greyhounds in Lombard model books of c. 1400 (Ames-Lewis pp. 62-65), so it's hard to say when the fashions were in style; he might have been copying someone else's sketches. The broad hat on men, that we see especially in the Brera-Brambilla, is in the Pisanello sketch book, too. The Zavatarri did their frescoes at Monza over a span of several years. Roettgen (Italian Frescoes: The Early Renaissance, p. 167) says they may have started as early as 1430. The picture from Monza that you showed is I think from the second or so in the series that they did, meaning it is in the early 1430s. (I am not counting the vault, which was done much earlier by someone else.) The clothing in the scenes done later is more functional, less flamboyant, which might suggest that styles had changed by the 1440s; or it might be because the scenes are mainly outdoors. (I need to see more 1440s Milan art, not tarot and not depicting a bygone era--of which Monza, like Lancelot, etc. is an example.) The clothing style in the CY is part of what suggests that the CY is a late version of a CY-type, that started sometime between 1427 and 1438. I say 1427 because that was the time of his marriage to Marie of Savoy, and also because that is when he seemed to get interested in miniatures, according to Kirsch, including miniatures that commemorated him and his forebears, including himself and his forebears as married, although with nothing in the extant manuscripts actually depicting him with a wife or fiancee. If one is illustrating a chivalric romance, as in the Lancelot or Pisanello's frescoes. one wants to make the clothes old-fashioned. You make them as old as you have models for, i.e. back to c. 1425-1430. And if you want a tarot that appears as an extension of an established tradition, you might do the same. Or so I would think within the realm of probability. The CY might also be early to mid 1440s, yes. But again, it might have been a near-copy of an earlier deck, with heraldics added, and perhaps coins, if they were copies of real coins (instead of the reverse). They were real coins; Berti proposes that the deck was produced between 1442 and 1447, because the CY’s coin pips bear the recto and verso of the golden florin coined by F. M. Visconti in 1442 and withdrawn from circulation at his death, in 1447 (Giordano Berti. Storia dei tarocchi: verità e leggende sulle carte più misteriose del mondo, Mondadori, 2007). But again if Francesco chose not to use them why would Galeazzo, especially when the loudest propaganda link was already present everywhere in the cards – “a bon droyt”, the man-eating-serpent, radiant sun, etc.? The tiny details of a coin 20 years after they stopped circulating would have been rather pointless; the point of connecting to the Visconti was already made by way of other devices. The design for the mint for coins to be circulated the following year would have been done the previous year (the coin in question began circulating in 1442) , thus no problem for the October 1441 Bianca/Sforza wedding theory – in fact there is a precise collocation of evidence and event here. The banners could not then have been to represent Francesco Sforza as Count of Pavia. Filippo was Count of Pavia then, and he had not indicated in any way that Francesco was his heir. If the CY was done in 1450, then, yes, the banners could signify Pavia. Sforza was recalcitrant in agreeing to marry Bianca (inciting Filippo to send Bianca to Ferrara for alternate suitors there) and he did not end up merely settling for Cremona and a few other minor towns (when both Venice and Florence were offering wagon loads of ducats, a palazzo in Venice, etc.) but for the ultimate if implicit terms of succeeding Filippo. The duplicitous Filippo did not of course make him Count of Pavia in title or will, but he would not have had a problem in indicating this future title in a painting on mere cards in the way of Pavia’s stemma (in fact Bianca ceremonially departed from Pavia to Cremona via the Po there). The vagaries of an implicit deal disappear with the forging of a Filippo’s will by Sforza’s chancellery after the duke died. Thus there was enough public circulation of the idea that Sforza was the heir apparent that the forgery of Filippo's will was not that brazen in Milan itself. At all events the forged will was a primary document Sforza (unsuccessfully) used to be granted the imperial rescript in the immediate years after taking Milan (see Gary Ianziti, Humanistic Historiography Under the Sforzas: Politics and Propaganda in Fifteenth-century Milan). I think the clothing styles are of the early 1430s, give or take a few years, I don't know how many. I’m glad you brought this up and provided more details! After I posted those images I too started thinking it was a style from the 1430s and that in the 1440s the past fashion was then used to depict “yesteryear” legendary or relatively “ancient" events: St. George, Teodolinda, King Arthur, etc.. Thus the CY projecting its contemporary subjects into the legendary realm (perhaps when “Virtue” was considered to have ruled the day, like in the Golden Age of Saturn). No different than the illumination showing F. Sforza discoursing amongst the “illustrious men”/generals of antiquity. Of course this is applicable for either 1441 or 1468 (although I have not seen evidence of a balzo painted in the 1460s), so I rest my case for the earlier date on the other arguments presented above. Do you have the book? I read about Berti's claim on a link that Huck provided, but I haven't gotten around to ordering it on Amazon. (If you don't have it, I'll order it, just for this point!) Does Berti have pictures of the coins? If so, I'd love to see them. A similar claim was made in Andy's Playing Cards, about Filippo's 1936 coins with the "rearing horse" design. But when you compare the coins with the images on the cards, they're only similar, not the same. I don't deny that there were real coins with that design. I was just saying that the coins might have come after the designs, and so appeared on the cards before the coins were made. You agree with that in your second paragraph. The only issue is how much earlier. Also, according to Andy's Playing Cards, Francesco did in fact issue coins with the same "rearing horse" design in 1450; she has pictures, and they are closer in appearance to the cards than the coins of 1436 are, but still not exact copies. See my post at http://www.tarotforum.net/showthread.php?p=1999548. So I'd love to see pictures of the 1442 coins. Yes, it would have been overkill to make all those coins. But Galeazzo Maria was not known for his subtlety. And if they were exact copies, they would have been easy to do, with existing museum pieces (i.e. coins no longer in circulation). I don't understand your point about the Fleur de Lys. If the Cary-Yale was an exact copy of an earlier deck, done before Galeazzo Maria was born, there is no reason why it should have any devices of Bona's. I agree that the probability of Galeazzo Maria's having made such a commemorative deck is rather low, compared to other possibilities. The main reasons for considering it is that the deck as a whole is such good condition, compared with some cards of the PMB--it doesn't show much sign of use--and also, the holes in the tops suggest that someone exhibited the deck. If in fact it is an exact copy, it would have been more useful in 1450, when Francesco was re-issuing Filippo's design (with slight improvements, more natural looking) on his own coins. I'm glad you agree about the clothes. You're the only person on THF so far that has said that. (And I don't say it as a secure point; it was said by Tolfo, on the "Storia di Milano" site, and when I looked into it, it made sense to me.) It shows either that the deck was meant to show people in the past, or that it copies, to an extent, an older deck-- or both. Or, much less likely, that it was actually made at that time, somehow with better-looking "rearing horse" designs than were on the actual coins of 1436.